Informed by the esoteric arts, eastern religion and philosophy, Minor White's belief in the spiritual qualities of photography made him an intensely personal and enigmatic teacher, editor and curator. 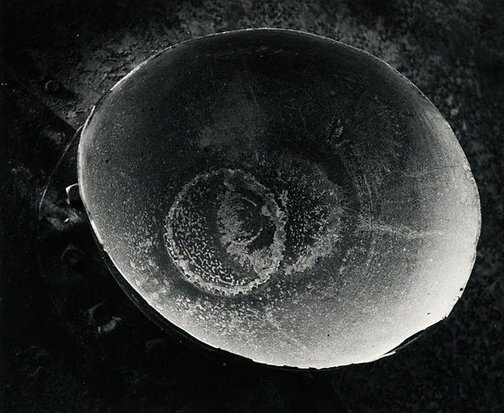 White's initial experience with photography was through his botanical studies at the University of Minnesota where he learned to develop and print photomicrography images, a view of life that he saw as akin to modern art forms. White advocated Stieglitz's concept of 'Equivalence' in which form directly communicated mood and meaning, that 'darkness and light, objects and spaces, carry spiritual as well as material meanings'.1 White disseminated his photographic theories through the influential quarterly journal 'Aperture', which he edited and co-founded with his contemporaries Ansel Adams, Dorothea Lange, Beaumont Newhall and others. Like Stieglitz, White also worked in sequences that through abstraction, expression and metaphor emphasised his mystical interpretation of the visual world. The sequences allow for a dialogue to continue through and in-between the images, engaging the viewer in a visual poem rather than any strict or formal narrative. The series, 'Sound of one hand', exemplifies White's study of Zen and esoteric philosophies, reflecting his meditation of the Zen koan from which he saw rather than heard any sound. The first of the series, 'Metal ornament, Pultneyville, New York, October 1957' presents an abstracted form that is both sensual and elusive, slipping in and out of ocular register. The ambiguous graduated tones and reflected light pull the eye into the centre of the image before vicariously dragging it back. This broken semi-elliptical shape is mirrored in 'Windowsill daydreaming, Rochester, New York, July 1958' as the gently moving curtains play with the light and shadows of White's flat, creating abstracted organic forms. Abstracted forms of nature were of great interest to White as can be seen in the rest of the series that capture the frosted window of his flat with its crystallised ice, condensation and glimpses of the outside world. Reproduced with permission of the Minor White Archive, Princeton University Art Museum. © Trustees of Princeton University. Donna Brett, Photography: Art Gallery of New South Wales Collection , 'A postwar modernist vision', pg.209-225, Sydney, 2007, 213, 218 (illus.). Minor White, Minor White: rites & passages , 1978, (illus.). Minor White, Mirrors, messages, manifestations , 1969, (illus. ).